Our comprehensive analysis of your trading results will reveal your strengths and weaknesses. As soon as we decided to create this project, we knew that we have to offer to our traders an unbiased look at their trading results. Why? Because it does not matter if the trader is a beginner or a professional, another opinion is always invaluable. For many traders, trading is also a lonely activity where many times, even your closest ones do not understand what you do on your computer for so many hours. How do we prepare the Account Analysis? 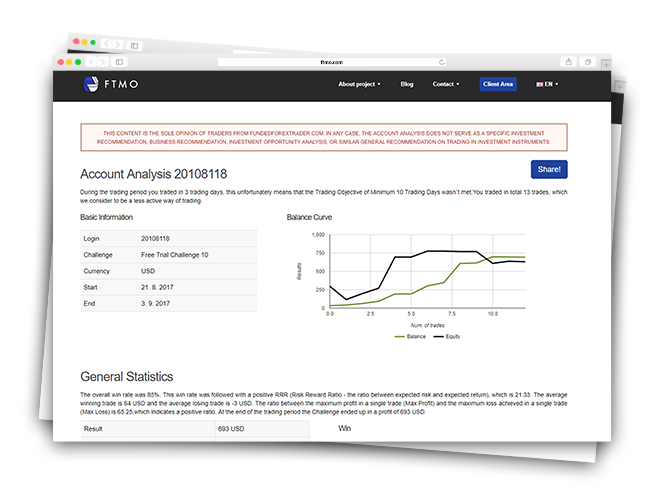 After your Challenge is over, we’ll take all your trading data, including commonly unavailable data, and formulate a number of indicators that could reveal places to optimize your strategy. See the sample Account Analysis of our successful trader. What do you find in the Analysis? How the Account Analysis helps you? What do our traders say about the evaluation?